These simple garlic mashed potatoes are made with lots of garlic, milk, and butter. Use a lower fat milk to cut calories a bit or use half-and-half for a richer mash. And feel free to increase the butter. The Parmesan cheese—preferably Parmigiano-Reggiano—is optional, but it adds excellent flavor. Place potatoes and peeled garlic in a large saucepan; cover with water and then bring to a boil over high heat. ​​Reduce the heat to low and cover the pan. Simmer the potatoes for about 20 minutes, or until fork tender. Drain the potatoes and garlic thoroughly and return them to the pan or to a large mixing bowl. Meanwhile, combine the milk and butter in a cup and microwave just until hot. Add the hot milk and butter mixture to the potatoes; mash until smooth, adding salt and pepper, to taste. Stir in the Parmesan cheese, if using. If using an electric mixer, avoid overmixing. 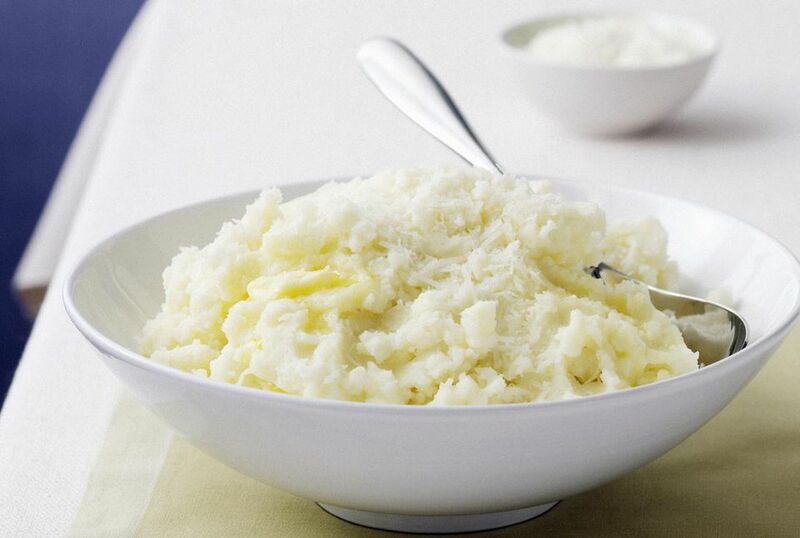 For perfectly smooth mashed potatoes, put the cooked potatoes and garlic through a potato ricer. The riced potatoes will mash beautifully with no lumps to worry about.